The Eritrean Catholic Church is a Metropolitan sui iuris Eastern particular church headquartered in Asmara, Eritrea. Established in 2015 by separation from the Ethiopian Catholic Church, it is in full communion with the Holy See. It follows the Alexandrian liturgical rite. Like the other Eastern Catholic Churches, the Eritrean Catholic Church is in full communion with the Holy See. It holds to the Christological definition taught at the Council of Chalcedon and accepts the universal jurisdiction of the Pope. These points distinguish it from the Eritrean Orthodox Tewahedo Church, which is an Oriental Orthodox church comprising most Christians in the country. Like the Eritrean Orthodox Tewahedo Church, the Eritrean Catholic Church follows the Ethiopic liturgical rite in the Ge'ez language, a Semitic language which fell out of common use several centuries ago. This rite is based on the Coptic Church liturgy. In 1839 Giustino de Jacobis, an Italian Vincentian priest, arrived as a missionary in the area that is now Eritrea and northern Ethiopia. He preferred to employ the local liturgical rite in the Ge'ez language rather than the Roman rite in Latin. He attracted a considerable number of local priests and laity to enter into full communion with the Catholic Church. He died in 1860 at Halai, near Hebo, in what is now the Southern Administrative Region of Eritrea. In 1869, Italy began to occupy Eritrea and in 1890 declared it a colony of the Kingdom of Italy, fostering immigration of Italians. In view of the changed situation, the Holy See set up on 19 September 1894 the Apostolic Prefecture of Eritrea, entrusted to Italian Capuchins, thus removing Eritrea from the territory of the Apostolic Vicariate of Abyssinia of the Vincentians, who were predominantly French. In the following year, the governor of the colony expelled the remaining Vincentian priests on the unfounded suspicion of having encouraged armed resistance. Most of the local population who became Catholics had been members of the Eastern Orthodox Patriarchate of Alexandria, from which the Ethiopian Orthodox Tewahedo Church separated only in the mid-20th century. They kept the rites of that Church in the ancient liturgical language of Ge'ez, giving rise to an Ethiopic-Rite Catholic community. The prefecture apostolic of Eritrea was raised by the Holy See to the status of Apostolic Vicariate (headed by a titular bishop) in 1911. In addition, an Ethiopic Rite Ordinariate of Eritrea was established on 4 July 1930, removing those Catholics from the jurisdiction of the then much larger Latin Church Vicariate. Father Kidanè-Maryam Cassà, who since 1926 had been their pro-vicar within the Vicariate, was appointed their ordinary and on 3 August 1930 was ordained titular bishop of Thibaris in the chapel of the Pontifical Ethiopian College in Vatican City. At that time they numbered less than 3% of the population of Eritrea. The greater importance at that time of the Latin Vicariate is reflected in the impressive church dedicated to Our Lady of the Rosary that was completed in 1923 as the seat of the Apostolic Vicariate. Even after the demise of the Vicariate in 1995, it is still called "the cathedral". At the beginning of the 1940s nearly 28% of the population of Italian Eritrea, which had been part of Italian East Africa since 1936, was Catholic; mostly Italians and of the Latin Church. There was a pronounced fall in the number of Italians present after the end of the Second World War, when Eritrea was at first under British military administration. The British census of 1949 showed that Asmara, the capital, had only 17,183 Italians out of a total population of 127,579. The departure of Italians accelerated further when Eritrea came under Ethiopian authority at the end of 1950. The relationship between the Latin Vicariate and the Ethiopic Ordinariate was thus inverted. On 31 October 1951, the Ordinariate of Eritrea was raised to the level of an Exarchate (the Eastern equivalent of a Vicariate) under the name of the Apostolic Exarchate of Asmara, at the same time as the Apostolic Exarchate of Addis Ababa was created. On 25 July 1959, the name of the Latin Vicariate of Eritrea, which in spite of the greatly reduced number of its faithful kept its rank, was changed to Apostolic Vicariate of Asmara. However, after the fourth and last bishop who was Vicar Apostolic of Asmara retired on 2 June 1974, the Vicariate was administered by the Capuchin priest Luca Milesi, who became a bishop only when the Vicariate was suppressed in 1995 and he was appointed the first Eparch of Barentu. 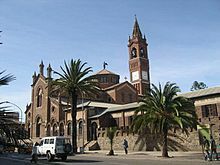 On 28 February 1961, the Ethiopian Catholic Church was established as a Metropolitan sui iuris Church, consisting of the Archeparchy of Addis Ababa and two suffragan sees, one of which was that of Asmara, while the other was the newly created Ethiopian Catholic Eparchy of Adigrat (previously the Prefecture Apostolic of Tigray). Coincidentally, the Eritrean War of Independence began later that year, and ended in 1991 with a decisive Eritrean victory. On 21 December 1995, under Pope John Paul II, parts of the Eparchy of Asmara became two new eparchies, based respectively in Keren and Barentu. The much reduced Apostolic Vicariate of Asmara was abolished. The only Catholic Church jurisdictions in Eritrea were thus all of the Ethiopian Catholic Church, making Eritrea the only country where all Catholics, including members of the Latin Church, are entrusted to the care of Eastern Catholic bishops. On 24 February 2012, Pope Benedict XVI created a fourth eparchy based in Segheneyti with territory taken from the then Eparchy of Asmara. On 19 January 2015, under Pope Francis, the Eritrean Catholic Church was erected as an autonomous sui iuris metropolitan church with Asmara as its metropolitan see and the other three Eritrean eparchies as suffragans, separating it from the Ethiopian Catholic Church, whose metropolitan see was thus left with only three suffragans. Eritrean Catholic eparchies from 1995 to 2012. In red that of Asmara, from which that of Segheneyti was taken in 2012. In north, that of Keren; in west, that of Barentu. The Eparchy of Barentu with faithful drawn largely from the Kunama people. The Eparchy of Keren with the highest percentage of the local population (nearly 12%). The Eparchy of Segheneyti in the country's Southern Administrative Region. Since 2004, the State Department of the United States of America has repeatedly listed the State of Eritrea as a country of particular concern with regard to religious freedom. However, it indicates that the Catholic Church is granted some favours, limited in number and extent, not granted to other religious communities: "permission to host some visiting clergy; to receive funding from the Holy See; to travel for religious purposes and training in small numbers; and to receive exemptions from national service for seminary students and nuns". National service is demanded of most Eritreans, men and women, between the ages of 18 and 40 or in practice 50 or more and is often of indefinite length. The Catholic bishops issued on 25 May 2014, the 23rd anniversary of the independence of the state, a pastoral letter that some saw as critical of the Government. An English translation of the document, the original of which is in the Tigrinya language, extends to 17 pages. The bishops spoke of the emigration of the many young Eritreans who risk their lives in the hope of emigrating to other countries. They repeated what they had written in 2001: "[N]o-one leaves a land of milk and honey to seek another country offering the same opportunities. If one's homeland is a place of peace, jobs and freedom of expression there is no reason to leave it to suffer hardship, loneliness and exile in an effort to look for opportunity elsewhere." They spoke also of "the delusion engendered as result of the non-achievement of the ends proposed, the uselessness of one’s own aspirations, looking to distant lands as the only alternative for self-fulfilment, are bringing a growing number of people to frustration and desperation. They find themselves looking at a horizon that grows always darker and heavier. Alongside this, the breakup of the family unit inside the country – through military service unlimited in terms of time and monetary reward and through the imprisonment of many young people in actual prison or in punishment camps – is exposing to misery not only elderly parents with no visible means of support, but also entire families and it is having serious consequences at the economic level as well as at the psychological and mental levels." The Eritrean agency TesfaNews questioned the bishops' sincerity and interpreted information provided by WikiLeaks as indicating that the Archeparch of Asmara "is a certified, anti-government and National service religious leader residing at the helm the capital Asmara". ^ "Erezione della Chiesa Metropolitana sui iuris eritrea e nomina del primo Metropolita" (PDF). Catholic Near East Welfare Association. November 29, 2016. Retrieved November 29, 2016. ^ Dan Connell, Tom Killion, Historical Dictionary of Eritrea, (Scarecrow Press 2010 ISBN 978-0-81087505-0), pp. 140–142. ^ "Chronology of Catholic Dioceses:Eritrea — Den katolske kirke". Retrieved 10 January 2017. ^ Revue d'histoire ecclésiastique, Volume 100, Issues 3-4. Université Catholique de Louvain. 2005. p. 1010. Retrieved 25 February 2017. ^ Administrator, shabait. "The Asmara Cathedral: An Architectural Wonder -". Retrieved 10 January 2017. ^ Cheney, David M. "Bishop Luca Milesi [Catholic-Hierarchy]". Retrieved 10 January 2017. ^ "Metropolitanate of Asmara, Eritrea (Eritrean Rite)". Retrieved 10 January 2017. ^ "Eparchy of Barentu, Eritrea (Eritrean Rite)". Retrieved 10 January 2017. ^ "Eparchy of Keren, Eritrea (Eritrean Rite)". Retrieved 10 January 2017. ^ "Eparchy of Segheneyti, Eritrea (Eritrean Rite)". Retrieved 10 January 2017. ^ "Eritrea won't shorten national service despite migration fears". 25 February 2017. Retrieved 10 January 2017 – via Reuters. ^ "Miserable and useless". 10 March 2014. Retrieved 10 January 2017 – via The Economist. ^ Refugees, United Nations High Commissioner for. "Refworld - Eritrea: Military service, including age of recruitment, length of service, grounds for exemption, penalties for desertion from and evasion of military service, and availability of alternative service". Retrieved 10 January 2017. ^ Pastoral Letter of the Catholic Bishops of Eritrea "Where Is Your Brother"
^ "Eritrean Bishops issue pastoral letter decrying emigration". Retrieved 10 January 2017. ^ "Gse Tightens Control on Official Religious Institutions". 21 December 2016. Retrieved 10 January 2017 – via WikiLeaks PlusD. ^ "Four Eritrean Catholic Bishops Issue Pastoral Letter Decrying Emigration". 10 June 2014. Retrieved 10 January 2017. Wikimedia Commons has media related to Eritrean Catholic Church.